Some people are incredibly lucky and have large bathrooms that they can do what they want with, but some of us have to make do with much smaller spaces. It is possible, however, to make your small bathroom look stylish and uncluttered. Here are a few ideas of how to design a small bathroom to suit your needs and your tastes. Whilst these are still relatively small in size, they can really disrupt the flow of a room, especially when it is already quite small. A corner sink not only saves space but looks good in a tiny room. Whilst it may be tempting to have both a bath and a shower separately in your bathroom, logistics-wise it just doesn’t make any sense. A small bathroom would be overwhelmed with the two so when designing your bathroom, consider opting for one or the other - or add a shower over your bath to get the best of both worlds. Light colours such as white, cream and pale blue will make the room look spacious as well as feel clean. If you have a small bathroom avoid dark colours on large areas of the wall. If you want to add colour do it with accessories. You may not be able to actually make the room bigger but you can certainly make it seem like it is. Bathroom storage can be quite big and bulky so consider how you are going to store your bathroom items. Consider storage off the ground such as shelves or a cupboard that doesn’t stick out too far - you want to make sure you have plenty of floor space. Hooks behind the door can be useful to hang robes and towels. Under sink cabinets are a good way of helping you utilise space as well. Spice racks on the wall are a cool idea to store lotions and potions too. If your room really feels too small, perhaps a wetroom is the best option. They are super stylish and add a modern touch to your bathroom. Wetrooms are particularly good if you have problems with accessibility, no having to climb into a bath for example and they are also easy to keep clean. Mirrors help to create an illusion of space which is just what you need in a small bathroom - plus they are incredibly functional too! They reflect light around the room and generally make bathrooms a much more light and airy space. Ensure natural light where at all possible. However, if you don't have enough natural light from windows you can fake it by using daylight bulbs. You will then get a natural light - perfect for putting on your makeup. You’ll want to make sure that your bathroom is stylish and classy so consider using a reputable company to do the work for you. Harrogate Bathrooms offer bespoke professional services for building & refurbishing bathrooms. 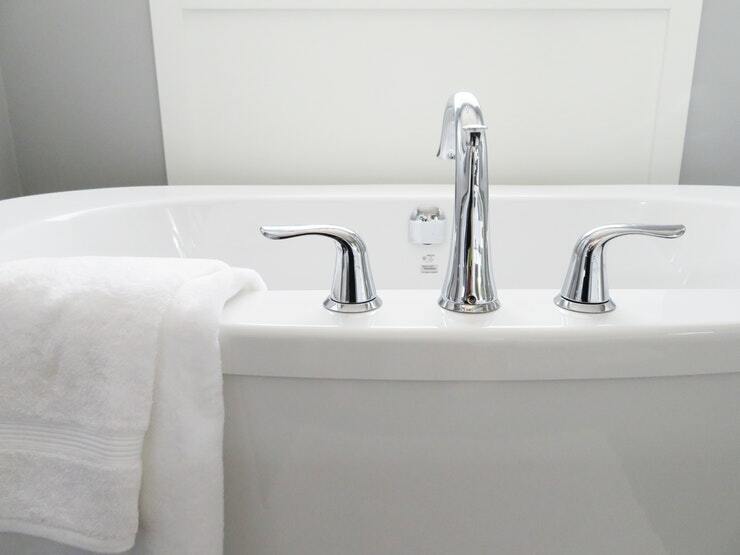 Check out this post for more tips on how to design a small bathroom. Do you have a small bathroom? Have you made any changes to make it seem bigger? I would love to have a wet room, it just makes sense!